Some time ago besides some other PCB's I ordered also the board for the simple 3cm beacon oscillator project from Paul, W1GHZ. The price was really affordable, and you never know when you will need some simple multiplier project like this. The latest, I heard that he is running with stock low of this board, so this means that people are building this stuff more and more. On the other side, not so many feedback on the web regarding the results obtained from this simple multiplier leaving idea that all this projects are working perfect with no problems or they are not working at all and people are giving up without an extra effort to tune properly this interesting approach to old fashioned multiplier idea. So here it is, completed and tuned multiplier for 10368MHz. Of course, I did make some small modifications to get the best results from this board, at the end it is working. I saw that Paul published the update on this project, but maybe somebody will find my hints useful too. The first thing that can be noticed, my tuning screws are quite long, this is not necessary. I did use the same project for some other final frequencies (11808MHz) and I left the screws long enough also for the lower frequencies. The size of the screws: M4 brass for the first (3.5GHz) pipe cap and M3 brass for the other two (10GHz) pipe caps. Secondly, I did use 9V power supply, instead of 8V. The only reason was the 9V voltage regulator that was handy for me. All MMIC bias resistors are modified to get the best results with 9V. As there is enough place on the board, I have two resistors in series for each MMIC stage. This way I can easily tune the bias current and the dissipation on resistor is lower, even I am using 1208 SMD bias resistors. I have to said that without Spectrum analyzer not reading the Paul's advice, tuning this multiplier can be quite confusing. So, at least any kind of power detector able to detect -10dBm @ 10GHz is a "must" to reach the final result. For the signal generator, I did use the handy Si-4133 generator where i have programmed 16 well known microwave frequencies. 1152MHz and 5dBm is what we need. The first pipe cap should be tuned to x3 = 3456MHz. This should not be a big problem because of the size of the pipe cap that does not allow to tune to the 2nd harmonic frequency. With the screw completely inside, backing the screw a few turns out the strong signal / power peak will be present at certain point at the first SMA tuning point. At this point you are at 3456MHz, all what we need from the first two MMICs and big pipe cap. Backing the screw more out you will reach another peak of the signal, almost the same strength, this is x4 = 4608MHz. 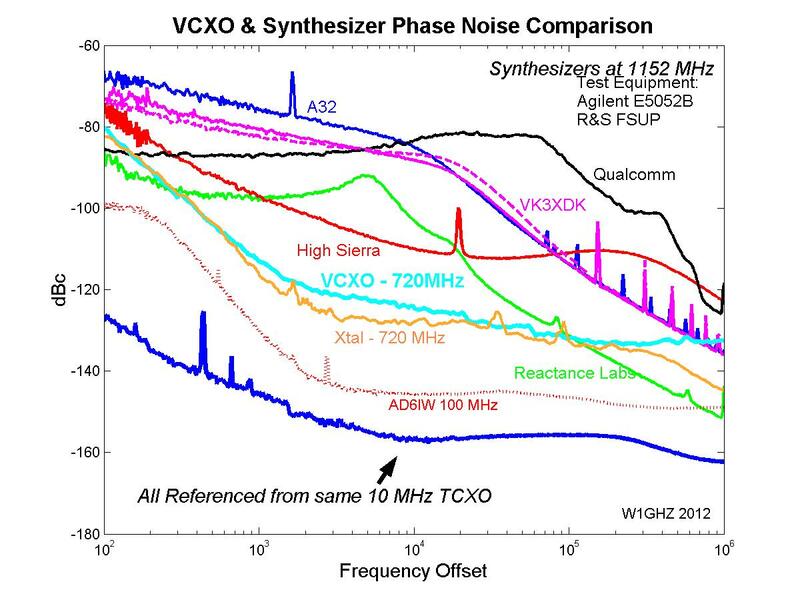 If you have a sensitive power meter or detector, backing the screw almost completely out of the pipe cap you can observe some weak peak also on the x5 = 5760MHz frequency. So, this pipe cap can be tuned to 3 different frequencies, our goal is to tune to the lower (first) one. This step was quite easy, the next one will require more precision and patience. The two 1/2 pipe caps should be tuned to 10368MHz. 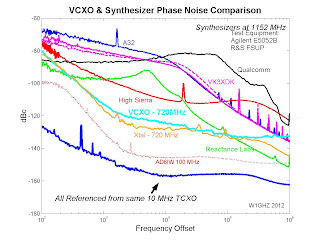 They are to small to be tuned to the x2 =6912MHz and they are too big to be tuned to x4 = 13824MHz so the only possibility is to tune them to x3 = 10368MHz. With the M3 screws completely inside slowly backing them, some where in the middle of the pipe cap you will notice the power peak at the output SMA. You will need to tune both pipe caps parallel to reach this point. Once you reach the peak, tune the both screws for the maximum output signal. This should bring you on the 10368MHz. I start to play with the first MMIC (SNA-286) bias resistors, and there was a nice improvement. I had to increase the resistor almost double to squeeze the maximum from this first multiplier stage. The output power went easily to +5dBm. I thought that same procedure with tuning the third SNA-286 bias multiplier will bring up the output power to desired +10dBm but this was not the case. Changing the bias did not bring any better results. Maybe SNA-286 are not so good in producing the harmonics at higher frequencies?? So, for the moment I stopped here, +5dBm @ 10368MHz is good enough for me, but for sure I will investigate the difference between the ERA-2, SNA-286 and some other MMIC candidates in producing high reach harmonics above 10GHz. Let's go back to a nice looking signal shape from the picture before. Really nice ha? OK, there is another (fuzzy) shot of the Spectrum analyzer screen. Not so perfect, ha? Well, believe it or not, this is the same signal from the previous picture. So where is the catch? To simply explain, I will compare this with the Miss universe competition :-) Looking from the balcony all those girls looking nice, but coming closer we can see that some of them are looking not so good as from the balcony. Same here, if you use the span of 100MHz you will get the first picture, if you use the span on the S.A. of 1MHz you can get the 2nd, more realistic picture. Well, this have nothing to do with the multiplier, but just want to give you an idea how Si-4133 signal looks after x9 multiplication. I want to gain that my Si-4133 oscillator is using the good quality Isotemp double oven 10MHz reference oscillator, so imagine how the signal will look using the cheap 10MHz canned oscillator. At the end, just a few ideas where to use this multiplier, of course the first idea will be a simple 3cm signal beacon source. I did use the same to generate the 11808MHz signal for one of my 24GHz transverters. You can hook up also the Comtech ATV TX tuned to 1161 MHz to reach 10450MHz. Driving this multiplier with the 720MHz can result with the output of 10800MHz which can be a simple L.O. solution for the 10368MHz transverter with the I.F. 432MHz (LSB). So many solutions for the simple multiplier.